Use three different colors of tissue paper folded together(the same way you would fold a fan), cut points at each end, use pipe cleaners to tie around the middle making sure you leave some at the end for placement, pull paper starting in the middle upward one layer at a time...end results are beautiful! 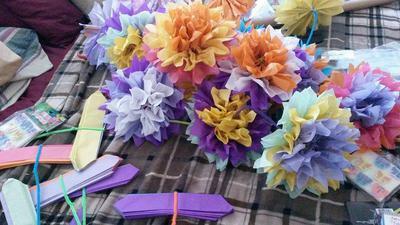 These paper flower decorations are perfect for a luau. Join in and write your own page! It's easy to do. How? Simply click here to return to Decorations.